GLASS TILES – plus extra for wastage. GROUT – matching the grout in the website photograph. CARBON PAPER & TRACING PAPER – for tracing the tiles onto the board. have to guess the shapes, thus optimising your sucess. COLOURED A4 PHOTOGRAPH – clear and easy to see. Some newer kits will have step by step photos. 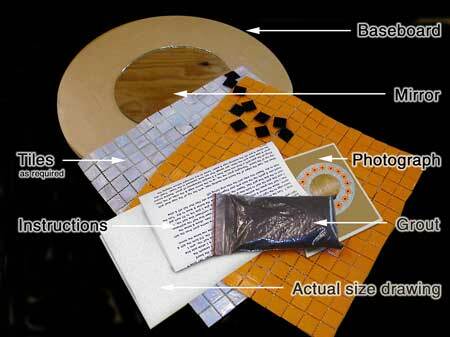 WHAT IS NOT INCLUDED IN OUR KITS – Glue and mosaic cutters (see tools).